The op-ed/guest column below is submitted for your consideration. 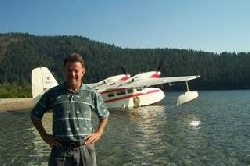 Bruce Kennedy, the well-known and respected former chief executive officer of Alaska Air Group, parent company of Alaska Airlines and Horizon Air, died last week (June 28) when the single-engine Cessna he was flying to visit his grandchildren crashed during a landing at a Cashmere, Wash., airport. Kennedy's life was highly significant and should be examined for its lessons – but not for the reasons most people think. A folk hero in the commercial aviation industry during the era of deregulation, Kennedy took a small, fledgling, regional airline with revenues of less than $100 million to an admired international carrier with revenues of more than $1 billion during his 12-year tenure as CEO. The consummate family man, Kennedy's conversation frequently turned with words of praise to his wife of 39 years, Karleen, his son and daughter, and his grandchildren. On the civic side, Kennedy was a frequently sought-after board member, serving the United Way, Washington Roundtable and the Seattle Branch of the Federal Reserve Bank. Kennedy's Christian faith manifested itself in service as an elder at his local church (John Knox Presbyterian), within his denomination (Presbyterian Church USA) and to boards such as Crista Ministries, World Concern and my own organization, Mission Aviation Fellowship (MAF). During his tenure as chairman from 1991-1998, Kennedy was instrumental in expanding the role of MAF in technology and fostered numerous international partnerships. However, many other men and women have been professional super stars and Wall Street darlings. They too have been good husbands and wives, fathers and mothers, and grandparents. They've given to their communities. They've walked out their faith in service to others. So what was different about Kennedy? What made his life "significantly significant?" First of all, Kennedy lived what I call "the undivided life." Kennedy didn't separate his faith from his professional, civic or personal life. His spirituality and the rest of his life were integrated, not compartmentalized. He was open about his faith, not forcing it on others, but was bold enough that people knew what – or more precisely, Who – he stood for. In his work at Alaska Air, this translated into a highly moral atmosphere and work environment. It fostered a corporate practice where employees were treated equally and respectfully, whether they were a ticket agent, ground crew member, pilot or senior executive. Kennedy was just as transparent on boards, in relationships and on his knees. And the results were the same – good fruit borne for all those around him. Second, Kennedy's life was not his own. When he could have lived what he once called the "blue-chip lifestyle," Kennedy and his family lived in the same modest house for years. He didn't own a boat. He didn't have a summer home. He gave time, talents and treasure to others. Once, when asked by a fundraiser to approach his supposed wealthy friends for a worthy cause, Kennedy replied, "What you don't understand is that my friends are the kind of people that leave oil stains in your driveway." It wasn't a joke. When stepping down from Alaska Air at the early age of 52, Kennedy said the company was not "his," but rather, he was just a "steward" of it. In his parting letter to employees, Kennedy, regarding his future plans, wrote: "Karleen and I will be open to opportunities for service, either in this country or abroad. We expect that whatever service endeavors we engage in will relate directly to our Christian faith. We look forward to serving people in the name of Jesus Christ." And serve they did. Teaching English in China. Taking dozens of refugees into their own home until the newcomers were acclimated and employed. Kennedy continued to serve Alaska Air as a board member. He served on the boards of numerous Christian ministries. Kennedy's final pursuit, however, combined his two greatest passions – his faith and his love of flying. He was at the forefront of the creation of Quest Aircraft Co., a faith-based, donor-funded enterprise to design, build and certify the "Kodiak," what many deem to be the next generation of bush plane for flying missions in remote areas of the world. MAF has been working closely with Quest in developing the Kodiak and placed the first order for 10 of new aircraft. Bruce Smith, president and chief executive officer of Wycliffe Associates and former chief operating officer of MAF, rightly said Kennedy was always conscious about how and where he invested his time and energies. He was focused on the eternal and took seriously the Apostle Paul's admonition that "the days are short." "He didn't want to waste what God had invested in his life," said Smith. Kevin Swanson is president of Mission Aviation Fellowship, a Christian international aviation and technology ministry based in Nampa, Id. For more on the life of Bruce Kennedy, go to www.brucekennedy.memory-of.com.